Columbia, SC – Keeping the aeration pumps running to the ponds that house thousands of fish at the Waddell Mariculture Center (WMC) in Bluffton, SC can all too often be challenging. The need for uninterrupted power is a need that has long been recognized yet unanswered. Until now. Because of the important scientific research and stocking of many recreationally important species of fish, CCA South Carolina stepped in this week to provide two generators large enough to keep all 25 outdoor fish ponds on the WMC’s grounds going in the event of power outages. “For the mariculture center to maintain uninterrupted production systems is important. Because our work with several recreationally important marine species is seasonal, the loss of electrical service for a period of time jeopardizes our important work” said Al Stokes, SC DNR. 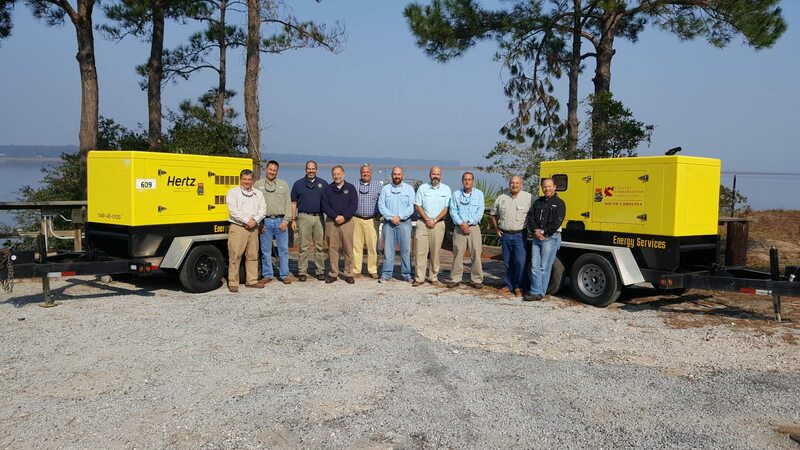 “These generators donated by CCA South Carolina will significantly reduce that risk and allow our researchers and scientists’ to continue their studies unimpeded”. The Waddell Mariculture Center is a field experiment station of the S.C. Department of Natural Resources and is one of the country’s largest and most sophisticated facilities for mariculture research. Located at Victoria Bluff, a 1200-acre property in Beaufort County, the site was gifted to the South Carolina Department of Natural Resources by the State Ports Authority in 1979. The site includes twelve 0.25-acre ponds, ten 0.5-acre ponds, and three 1.25-acre ponds. The ponds are lined with high-density polyethylene which is overlain on the bottom with native soil. All ponds and tank systems can be supplied with seawater from the adjacent high-salinity estuary or freshwater from the well. For 30 years, the center has worked with a variety of species including striped bass, white bass and their hybrids, two sturgeon species, cobia, whiting, red drum, black drum, black sea bass, flounder, spotted sea trout, tilapia, and seven species of marine shrimp, freshwater prawns, hard clams, bay scallops and oysters. CCA South Carolina was able to secure the two generators in early August and with the help of Flint Equipment Company and Reeves Trucking the generators are in excellent working condition, insuring service for the WMC for years to come. The recreational angling advocacy group believes in the work being done at WMC and like several other important habitat and research programs they have provided vital equipment, material for reefs, manpower for habitat restoration, and funding now exceeding $200,000 in the last six years.